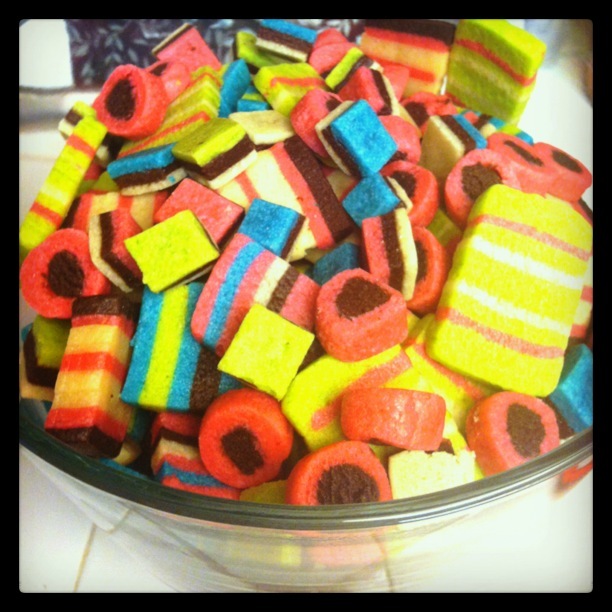 Cookies disguised as candies… So cute and colorful. My husband is a teacher and had back to school night this week. When he asked me to provide some sort of baked good that he could offer to his parents, my mind started spinning. I see SO MANY recipes on Pinterest that I am always dying to try that I jumped at the chance to make something new and special. 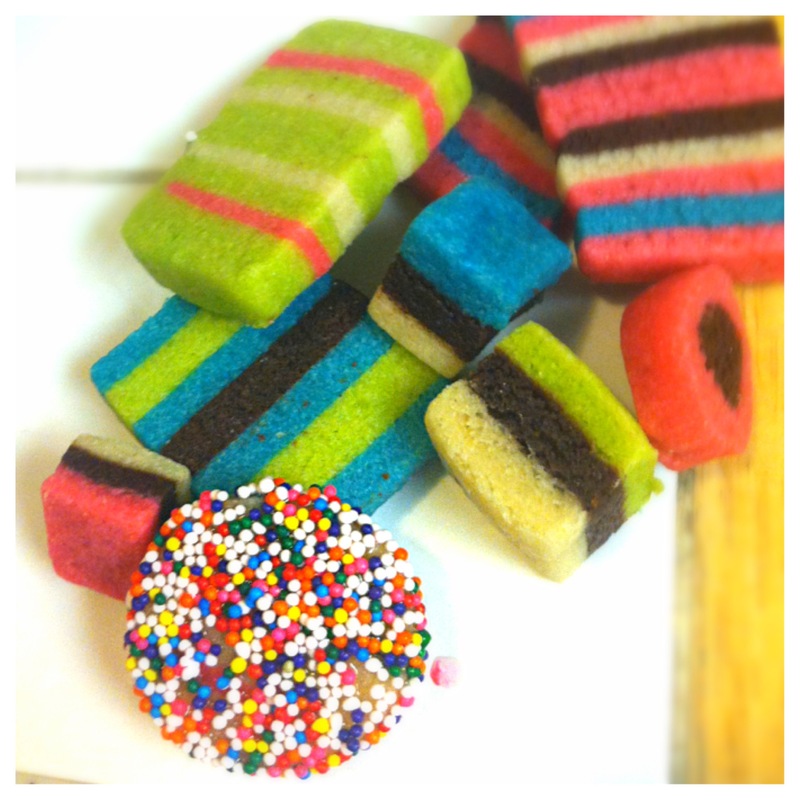 I decided on some cute Allsorts inspired cookies because they were so cute and colorful. And because I thought they would be easy for parents and students to grab as they come into and out of DH’s classroom. So, before I give you the link to the recipe that I used, let me tell you what I changed and what I will change for next time. First off, I am not super familiar with Allsorts candies because I’m not super crazy about licorice. Therefore, I had to check back a couple times to remember what colors to use and how to stack and slice them. I also took liberties and some of the cookies I ended up with (while still really pretty) didn’t resemble the the candies AT. ALL. Oh well! I did not have any white food coloring, but I would love to get some and use it in the future. For the chocolate section of the dough, I would half the amount of coco powder she called for in her recipe. She called for 2 cups of flour and 1 cup of coco powder, next time, I will use 2 1/2 cups flour and 1/2 cup coco powder. The flavor was too strong for me. I will add a little black food coloring to make sure it’s nice and dark still. I added almond extract and coconut extract to the colored doughs. I like those flavors and I think it gave them a nice touch. Be sure to freeze the dough after forming/cutting your cookies before baking. It kept them from changing shape in the oven. And, for that matter, freezing between rolling out and cutting really helped keep the dough workable. And that’s it. I loved these cookies and look forward to making them again. Here’s the recipe I used. Aren’t her cookies and pictures absolutely gorgeous! Her photography is amazing and you can see why I was inspired to make some of these little guys. Don’t the red round ones with chocolate centers look like dog treats, lol? The cube ones with three colors are about 1/4 x 1/4 inch and the round one with sprinkles is about 1 inch round. Cute and tiny. Thank you! They were fun to make and tasted so so good. The small size made then too easy to eat too many, though!